This is a preassembled LED Tower Light that offers a high degree of flexibility along with exceptional brightness. The 70mm Tower Light is visible at long distances, appears grey when off, and supports RGB 14 color segments, giving the engineer a wide variety to pick from. If required, modular segments can also be ordered. The color of each segment changes based on the input status. Top-mounted audible segments with a 75–101 dB range can also be installed to supplement each visual condition. Monitoring and control are completely remote thanks to wireless options, including bases and segments. The control options are easy and user-friendly, providing simple options for flashing, strobing, timers, and condition management. These are the segments that make up the above-mentioned TL70 Tower Light. Available in up to 14 colors, the TL70 Modular LED segments can be conjoined with ease and programmed to represent conditions of your choice. Each base supports up to six single function segments. The build is rated at IP65 and can be installed in a variety of environments. In order to match the contrast of the location, you can pick between black or grey housing. Similar to the Tower, the modules can be programmed for a variety of lighting modes, including flashing, sweeping, and strobing. 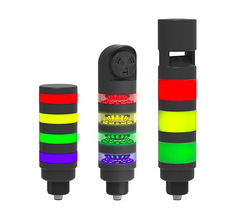 The TL50 Multicolor Tower Light hosts an almost limitless capacity by combining the vast color options provided by RGB LEDs. The exterior is rugged and simple to install. 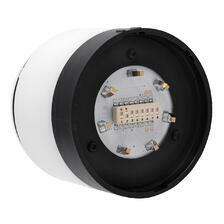 Up to 10 light segments are supported in a normal condition while an audible segment can also be installed. Control is carried out through an IO-Link which presents parameters such as flashing, color, rotation, and intensity. The luminosity itself has high visibility and is sufficient to cater to industrial requirements. 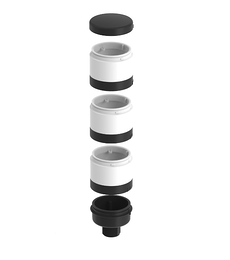 Separate models are available with standard, sealed, or omnidirectional audible elements. Moreover, compact and beacon models are also available, which feature a more intensive display than the regular ones. Built with long-lasting LED technology, the easy-to-install, self-contained TL50 Tower Light indicators provide highly visible illumination and equipment indication. For easy integration into the factory floor, models feature IO-Link communication for monitoring and controlling light and audible segments. You can carry out the order placement and configure it through Banner Engineer’s online tool. Seven colors are displayed in a single tower with a total of ten color choices in standard brightness and five in high brightness. The LED Tower Light is manufactured in universal AC voltage models for minimal compatibility issues. 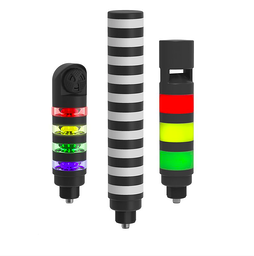 The multi-color CL50 Series LED column lights serve as highly visible indicators, best for operator guidance and equipment status management at long distances. 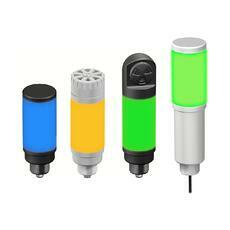 Much like other tower lights from Banner, they are housed in IP67 rated cover and are self-contained with no controller needed. Models are available in up to three colors, and the LED light source lasts 100,000 hours on average at 85-264V AC or 18-30V DC. The lights require no assembly or tweaking and are immune to any EMI and RFI interference.